You know when there is that moment you find a new brand, and you feel absolutely everything fits your style. Well, this is what happened to me when I found k/lab. All the pieces are gorgeous, fun, fashion-forward…and don’t break the bank! Since I shot these looks last week, there are already new pieces that I want to get- like this gingham off the shoulder dress or this gingham wrap skirt (give me anything with this print for Summer!!). This is because new looks from k/lab hit the racks (and website) weekly! Check out the widget below for some of my favorites…and take advantage of the stewed promotion- details below! This year’s Miami Spring has been more than perfection- breezy days and some chilly nights. 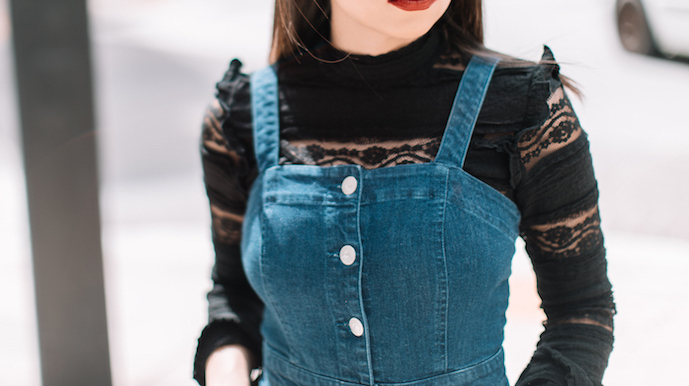 I’m always excited to layer: adding this sheer lace top to this denim midi dress is the best way to elevate the look. I also can’t wait to wear the denim dress with booties and a red bandana. Another piece I’m obsessed with: this clear bomber jacket. It’s the perfect mix of sporty, edgy, and cool. I paired it with a color block slip dress and sneakers…but this dress would look amazing for a night out with some killer heels! Ready to be a k/lab girl? Welcome to the club! If you are loving the k/lab pieces as much as I do, use the promo code TAKE15OFF for a 15% off from the site- starts 4/20 throughout 4/24. Happy Shopping! FTC disclosure: This blog post was sponsored by Kohl’s and ShopStyle. All opinions are my own. Thanks for supporting the brands that keep Nany’s Klozet going.